What forms will such moments take? 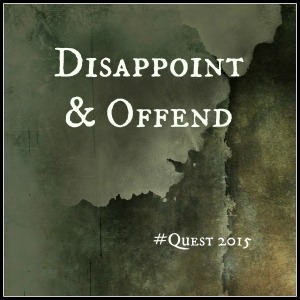 The seventh prompt for reflection in Quest 2015 comes from Sunni Brown. In addition to the prompt, she encouraged us to doodle, draw, photograph, or write into these questions. The word sacred tripped me up immediately. One of my current journeys is trying to find secular language for natural human experiences that traditionally inspire religions interpretations. In my lifelong quest for understanding of my so-called spiritual experiences, I have spent many years working with interpretations of religious language that are expansive enough to include my experience as someone who is uncomfortable with any interpretation of these experiences that cannot be verified empirically. And, I am tired of it. I want language that doesn’t require me to translate it internally for my comfort. That said, one definition of sacred is that which is entitled to reverence and respect. Reverence is a deep form of respect, one that reaches towards devotion and honour. So, in secular language, the prompt is How could you make moments of joy a priority and show them honour and respect? And this is a question I know how to answer. I can make moments of joy a priority by actively looking for them, noticing them, and savouring them. 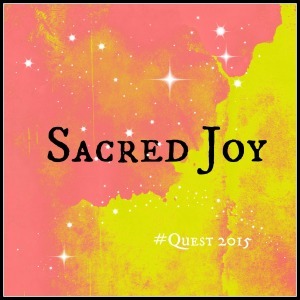 I can follow my body wisdom toward activities that tend to trigger joy. I can show them honour and respect by not rushing them, by allowing them to take space and time in my life for as long as possible. In some cases, I will be able to honour them by documenting them – taking a photograph or writing a poem. In others, sharing them with others, pointing out a joy trigger to someone nearby, will be appropriate. I did respond to the invitation to doodle, draw, or photograph into these questions as opposed to my more traditional writing. But, with a slight twist. I used playful digital photo manipulation as my entry point into today’s prompt. Those who have been following my Quest 2015 posts may have noticed a pattern to the images at the top of my posts in this series. They are all variations on the same image. 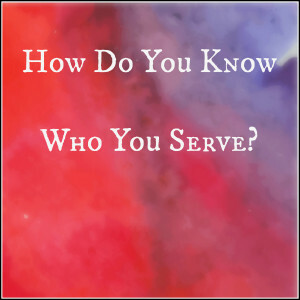 I knew I wanted to link the posts together visually when I started the series, so I found a background image and started working. 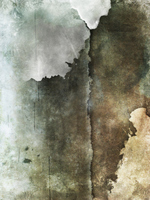 I cropped to a square I like, and then generated 18 colour variations using the tools at PicMonkey. 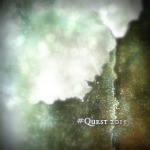 I added the hashtag #quest2015 and a border, then waited for the prompts to be revealed. Each time a prompt is revealed, I select a ready to use image, add the prompt title, and put it in my post. I played with some options that didn’t fit with the style I was going for. When I made the pink and yellow variation, I liked it, but wasn’t sure I would use it because it seemed very different from the others I had chosen. However, it struck me as perfect for this prompt, so I used it. But, it was missing something. So, I played around in PicMonkey, adding stickers and effects, deleting them, trying new effects, and finally settling on adding stars. After some playing around, I had added 5 star effects to the picture and created an image I liked – the one at the top of this page. 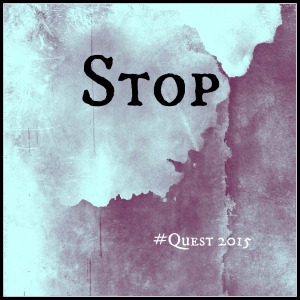 And, in playing with the images, I unlocked my resistance to the prompt and was able to dive in and write. Sunni Brown is leader of The Doodle Revolution – a global campaign for visual literacy and also the name of her new book. Sunni is also the author of Gamestorming, named one of Amazon’s Top 100 Business Books, which lays out visual thinking techniques for business. Sunni’s common sense, wit, and pragmatic applications of neuroscience have led her to consult with Disney, Sharpie, Zappos, and elsewhere. Her TED Talk “Doolders Unite!” has been viewed over 1 million times, and Fast Company named Sunni one of the Top 100 Most Creative People in Business. 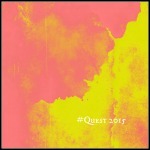 The third prompt for reflection in Quest 2015 comes from Michael Bungay-Stanier. For a long time, I wasn’t willing to disappoint, offend, or upset anyone who offered me love that seemed in any way conditional, whether they were friends or family. 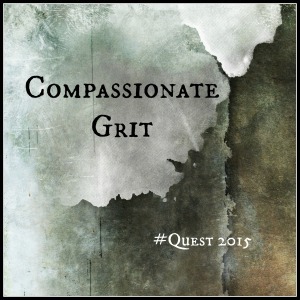 The cost was that whenever my needs conflicted with theirs, I suffered. These days, I am willing to disappoint or upset anyone if I believe my health and happiness depend on it. In many cases, I am willing to do the work necessary to maintain a healthy relationship that include disappointment and people being upset with each other. The trickier question is who am I willing to abandon. There is no Great Work calling me that is worth abandoning my children. That is my one clear bottom line. Beyond that, there are some people I know I must abandon, people who are actively hindering my ability to do my most important work. These people, I am willing to abandon without hesitation. But what about people who are preventing me doing my work without getting actively in my way. I do not want to actively abandon them. But, I must be willing to set boundaries with them to protect the time and energy I need for my work. And, if they will not respect those boundaries, I must be willing to let the relationships go. I will be tested as each case presents itself individually, but I believe I am ready and willing to abandon that which does not support me. My intention is to serve my work in 2015 and to curate my life in service to my children and my work. Banned from his high school graduation for “the balloon incident,” Michael Bungay Stanier has since found more productive ways to direct his creative defiance. He is author of numerous books, including Do More Great Work (with 90,000 copies sold) and End Malaria, a collection of articles about Great Work from thought leaders that has raised about $400,000 for Malaria No More. He is founder and Senior Partner of Box of Crayons, a company devoted to helping organizations do less Good Work and more Great Work. Their Fortune 500 clients include TD Bank, Kraft, Gartner, and VMWare. 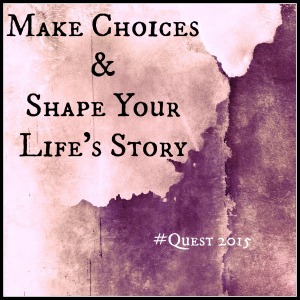 The second prompt for reflection in Quest 2015 comes from Jason Silva. When I read this prompt, I immediately thought of the practice I started this fall of walking by the shores of Lake Ontario almost every day. I wrote myself a prescription: 10 deep breaths on the lake shore 3-5 times a week. Even when I cannot make time for more than those 10 deep breaths, that time centres me and opens me up to the wonder in the world. On the days when I walk the shore for longer, stopping when something catches my eye, being there transforms me. I find my best self by the lake shore. Many moments of awe surprise me when I walk in nature: a bird call, a butterfly that catches my eye, the sun breaking through grey clouds. Each comes as a surprise, captures my attention, and then passes into the next moment. Walking in nature feeds my soul, feels meaningful, and refocuses me on wonder. Part of the power of walking in nature is the walk, part is the awe nature inspires in me. In his video How We Create Serendipity, Jason Silva talks about those chance occurrences that improve our lives and posits that they happen more often in contexts where extremes are juxtaposed, where things that do not fit with each other enter the same space and shake things up. And, it struck me that my walks by the lake shore are moments of juxtaposition. To get from my house to the lake, I drive through manicured suburban streets that could be anywhere, past houses that could be in England or in Canada. When I get to the shore, there is nowhere else that I could be. No other strip of land looks like this. No other day has ever made the waves just like this with the light just so. My excursion to the shore is palpably unique. And when I return to what could be suburban monotony, for a period after my visit to the lake, I remain awake to the moment that is. To curate my life to invite creativity, serendipity, and awe is as simple as getting to the lake as often as possible. But, I could do more. I take at least one picture every time that I go to the lake, to capture over time the variety I encounter. I have empty picture frames, frames I bought that were the wrong size for a project. Hanging a few of my pictures of the lake in my house will serve as a reminder of the transformative power of the lake, both reminding me to get out of the house and go to the shore, and inspiring me on the days when I do not go. 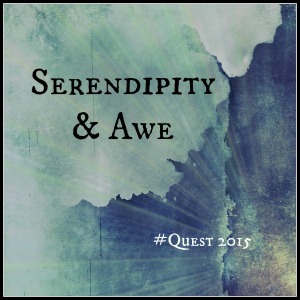 And so, I have a creative project that I hope will work on me in the mysterious ways of nature, serendipity and awe. According to his bio, Jason Silva is an epiphany addict, media artist, futurist, philosopher, keynote speaker, and TV personality. He is the creator of Shots of Awe (13 million views) and the Emmy-nominated host of National Geographic’s Brain Games. I am currently taking a class with Eric Maisel, who believes that art-making is a way of making our lives feel meaningful. In fact, for those of us with Creative Compulsive Disorder, I would argue that we need to make things in order to feel a sense of meaning and purpose in our lives. And, human beings have a need to feel a sense of meaning, a connection to that which is bigger than us, in either secular or religious terms. I tell stories in written and performed form to help people feel less alone through engagement with the inner worlds of characters who reflect aspects of the experience of human existence they can relate to. This is my calling, my contribution to moving the world to compassion, and I call on the powers of beauty and individual truths to reveal goodness and encourage people to see the good in themselves and others. Art-making is my primary practice for meaning-making in my life, and I definitely want to be part of the meaning-making world of others. Art, whether improvised, performed in repeatable forms, written, or otherwise connects me to my focus toward beauty, truth, and goodness. Beyond my desire for political activism which is constantly mired in compromise and negotiation and has impact on a structural and institutional level, art touches the heart and the existential questions of living as a conscious human being. Art, and the emotions stirred by art, connect the inner experience of one person to another and make us feel less alone. Being part of the world connecting people’s inner worlds across the gap between people feels like a worth-while endeavour to me even when the world doesn’t value it. Beyond this understanding that my creative work is of value to the world, I am compelled to do this work whether I choose to or not. Without this work, my life loses its meaningfulness and I struggle with existential depression. The only way for me to live a life engaged with the world is to constantly be shaping my experience, my knowledge, and my understanding of the world through aesthetic means into reflections of my current state, to share my deeper truths with others and reduce my own experience of existential aloneness. Through touching other people and generating the experience in them of recognition that they are not alone, I see that I, too, am one of many. 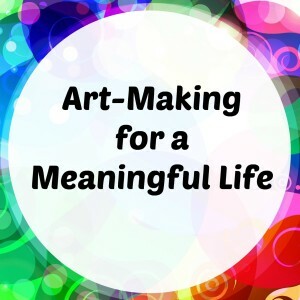 How does creating art function as a way of making your life meaningful? 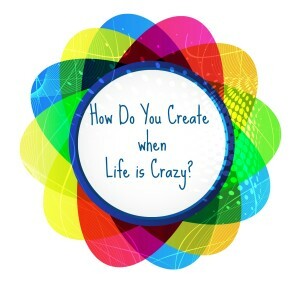 How Do You Create When Life is Crazy? Life is always busy. There is no perfect time to create a work of art. There will always be family and work responsibilities, doubts and fears, relationships that need cultivating. Some times are more challenging than others and some people have more support than others, but no human being is immune to the pressures of life. Creating anything requires one to work in the middle of things, whatever those life challenges may be. And each person must figure out what works for them if they are to be productive. The most important elements of creating in the middle of things are psychological. The difference between success and failure often comes down to intention. If you intend to create and believe that your creative process and creations matter, you will find a way to work. If, however, you simply want to create or don’t believe that your creative work matters, you will not resist the pressures that push against making time to create. Once you have the intention and claim that the work matters, then the task of making the creative time becomes one of facing the reality of your specific situation and making a plan that covers the requirements of the rest of your life and your creative work, while letting go of the need to do all the other things that others might want you to do. How can you strengthen your intention to create? You can also affirm your intention to matter with a practice of saying “I intend to matter” or “I matter”. You could commit to saying it a certain number of times a day, at certain times of the day, or simply as often as possible. In any case, strengthening your intention to matter will help you maintain the motivational energy to do the creative work when life is busy around you. Whatever your excuse for not working is, start adding a ‘But I will work anyway’ to the end of your sentence when you talk about it. Sometimes, we get to our work space and the things of life are in our thoughts and we can’t see our way to focusing on our work. At such times, this exercise is useful. Think of a snow globe. When you shake it up, the snow fills the globe with chaotic movement, swirling into the snow effect. Then, it begins to settle, falling with gravity to the bottom again, and eventually settling into quiet. Creative work triggers anxiety, an inner chaos. When we decide to create, we shake ourselves up like a snow globe. The rest of life’s pressures get mixed in there with the inevitable mix of new ideas and anxieties that are part of creative work. It is all too easy to get caught up in that whirling and forget that we can settle ourselves. When it feels too chaotic around you for you to focus on your current project, think of yourself as a snow globe, and imagine that inner chaos settling to the ground and getting quiet, creating the mental space for creating. Do you have a process for committing to your creative work even when life is crazy?